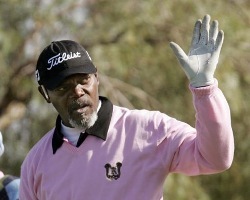 Samuel L. Jackson is one of my favorite actors of all time. Not because he’s good (though he’s very good when he want to be), but because he’s so unapologetic about how he goes about his business. He’s never turned down a role that I know of, he’s public about his former addiction to drugs, and even better, he’s a complete golfing fanatic. He even has golf time written into his movie shooting schedules. Just look at some of the glorious golf outfits he’s rocked over the years! Just look at him and tell me he doesn’t make that pink shirt look cool. Better yet, tell him that. Go on, say what one more time! I dare you! I double dare you! Ahem, sorry, too much Pulp Fiction.